The areas of occlusion (dental bite) in dentistry hasn’t had much emphasis until recent years, meaning dentists haven’t been involved in treating patients with disorders relating to their bite and the related joints and muscles. As a rule of thumb, the specialty most involved in this area is orthodontics. Areas of dentistry that have been involved in treating temporomandibular dysfunction include prosthodontics, periodontics, oral surgery, and general dentistry. Currently, temporomandibular dysfunction (TMD) refers to the syndrome, and temporomandibular joints (TMJ) is used to describe the anatomy of the location. Although poor bite doesn’t automatically contribute to jaw dysfunction, pain, and joint disintegration, one of the conditions associated with temporomandibular disorder is a bite that is misaligned. This condition causes significant pain and distress among patients, and confusion among both patients and health practitioners. Not all dentists treat malocclusion, so you are always advised to initially discuss any issues you may have with your general dentist. If they do not treat this condition themselves, they will refer you to a specialist. Placing hot or cold packs onto the affected area is a fast, simple, inexpensive, and moderately effective treatment. Rather than cure the disease, hot or cold packs only alleviate any pain you may experience. However, this reduction in pain allows additional therapy to continue at the same time. Placing hot or cold packs can become habitual, and should be used sparingly. Unless this treatment is used excessively, there are no risks involved. Overuse of hot packs can lead to damage of soft tissues. Electrical Neurostimulation (TENS) are all possible alternative therapies. The cost is very low if hot, moist towels or ice in a plastic bag are used. Moderately priced cold or hot packs are also commercially available. Pain will continue and function may remain limited, but the condition may ease without treatment after a short period of rest. Hypnosis can be successful in the reduction or elimination of clenching or grinding teeth, headaches, and other related issues. The cost is relatively low, and this treatment is simple and painless to apply, and can be used to manage many physical conditions. While hypnosis can be an effective treatment for many people, it does not work for everyone. It can be a time consuming process, and requires complete acceptance and cooperation of the personing undergoing treatment. Only a very low percentage of healthcare practitioners offer hypnosis as a therapy, and finding a practitioner that does will often require a high level of effort. Contrary to many popular beliefs of hypnosis, patients are in complete controls at all times during treatment. Professionally managed hypnosis presents no risk to the patient. Although significantly less expensive that alternative options such as surgery and oral rehabilitation, the cost of hypnosis is moderate, and often requires a significant time investment. The condition would continue unless alternative therapies were applied. Discomfort and pain caused by muscle tension will usually reduce quickly, often allowing normal function of the affected area. Because the muscles to be relaxed cannot be targeted, muscle relaxant drugs will usually relax other muscles in the body. This can cause tiredness and limit both physical and mental activity. All medications have possible side effects and potential to trigger allergies. If used to treat occlusal problems, use and dosage should be limited. Other possible treatments include hot or cold packs, physical therapy, pain reducing medication, and Transcutaneous Electrical Neurostimulation (TENS) application. Short-term use of muscle relaxants usually incur a moderate cost. Pain will continue and ability to move the affected area will remain reduced unless alternative treatments are applied. To aid correct contact of all teeth at once, the bite can be adjusted by removing small amounts of previously placed crowns, bridges, or unworn sections of enamel on the chewing surfaces of the teeth. When the teeth of the upper and lower jaws meet correctly, the pain and discomfort of the jaw soon disappears. Under normal conditions, this technique is simple to implement, logical, and painless, while immediately correcting the imbalance of the bite. The removal of small pieces of the tooth structure, or dental filling or prosthesis material may be considered a disadvantage by some. However, without doing so, the condition will continue as it cannot heal itself. This procedure can be compared to car tires being unbalanced – they will remain unbalance and affect the performance of the car until they are altered. In situations where fillings, crowns, or tooth structure require alteration to balance the bite, an experienced dentist will have no problem making these changes. The risks of this option are very low. There are very few alternatives available if the jaws are truly misaligned because of incorrect tooth contact. Possible alternative options include continuously wearing a bite-correcting splint, or rebuilding the fillings, crowns, and bridges to help correct the relationship. Bite adjustment therapy is moderately priced, often costing more or less the same as one crown. The condition and related pain and discomfort will continue or worsen. As it can be removed from the mouth, wearing any type of bite splint is reversible, and the effects of this therapy are very effective. Splints work by directing the teeth to meet correctly or opening the bite, which places biting force on the front teeth to relieve stress. Splints also prevent excessive grinding from harming the remaining tooth structure, as the they are worn on the opposing teeth. The pain relief provided by an occlusal splint is only effective while the splint s being worn. The associated pain often returns if the splint is not worn for a significant amount of time. 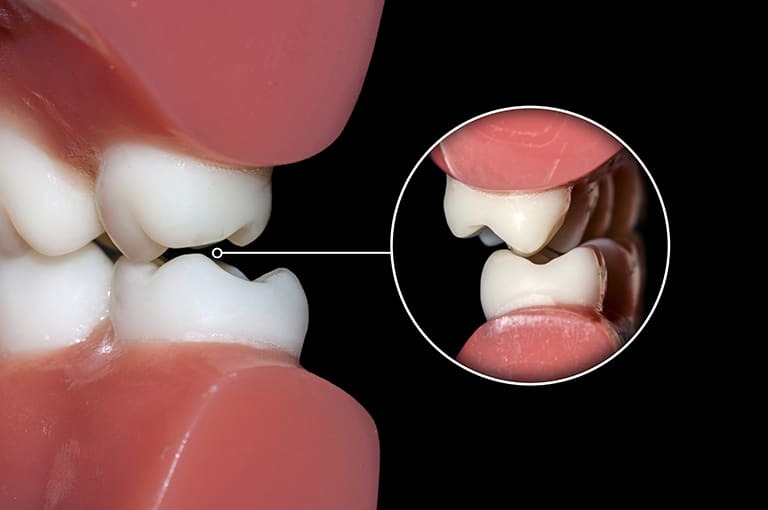 Occlusal equilibration (bite adjustment) is often required after the splint has reduced pain to ensure the teeth occlude in the saw way provided by the splint. Because they’re softer than the opposing tooth structure used for chewing, splints often wear out after a few years of use. If splints are used correctly, there are usually no risks involved. However, dental caries (decay) may develop if the teeth are not thoroughly cleaned each day. An occlusal splint is one of the most effective and inexpensive methods of repositioning the jaw and protecting the teeth. If your dentist recommends a splint as the best option for your condition, you should take it. Occlusal splints are a moderately costing therapy, and depending on the particular needs, usually costs no more than double the cost of one crown. Unless another form of therapy is applied, the condition will remain and worsen over time. Although not unheard of, it is very rare for this condition to get better without treatment. Placing crowns and bridges on most or all of the teeth is known as oral rehabilitation. The correct relationship of the upper and lower jaws can usually be established and stabilized through oral rehabilitation. Additionally, the appearance of the teeth and smile can be improved. This procedure can be expensive, and due to normal wear and possible breakage, will often require replacement after several years of use. A significant time investment is also required for this form of therapy. Oral rehabilitation can sometimes cause endodontic (root canal) therapy to be required in some teeth, and there is no guarantee that the treatment will completely resolve the jaw problem. As an alternative to oral rehabilitation, an occlusal splint may be worn indefinitely for developing and maintaining an acceptable relationship between upper and lower jaws, and correct alignment of the jaws. Most methods that fall under the oral rehabilitation category tend to be among the most expensive of available dental therapies. The condition that requires treatment will remain and continue to worsen. Orthodontic treatment is sometimes required for treating occlusal dysfunction. When treatment is required, orthodontic therapy is used to reposition misaligned teeth back into their correct natural position, and to stabilize the relationship of the upper and lower jaws. A large time investment of between several months and several years is required for orthodontic therapy. In addition, the teeth often have many visible wires, brackets, or bands throughout the duration of the treatment. Any therapy involving the movement of the teeth carries a risk of developing irreversible conditions such as endodontics (root canal therapy), tooth roots becoming shorter through root resorption (degeneration), along with many others. There is also no assurance that the orthodontic therapy will fully solve the occlusal problem until the teeth have been moved successfully and treatment has been completed. Some of the available alternatives to orthodontic therapy include occlusal equilibration (bite adjustment), oral rehabilitation (altering the tooth structure), and wearing occlusal splints (bite splints) indefinitely. This moderately priced therapy is placed between the high cost of oral rehabilitation and the lower cost of an occlusal splint. Unless an alternative treatment is sought, the condition will remain and likely worsen. This type of therapy is simple to implement, inexpensive, relatively pain-free, and usually very effective. It is also reversible and non-damaging if used correctly. The physical exercises are typically time consuming, and some may induce a certain amount of pain. They initially require some sort of supervision to ensure correct application of the exercises, and a level of self-discipline is required of the patient. When applied correctly, there are very few risks involved with physical therapy. Some other effective alternatives include muscle relaxation and/or pain-reduction medication, and Transcutaneous Electrical Neurostimulation (TENS) therapy. The cost of physical therapy is relatively low when compared to some other alternatives. Doing nothing will result in the condition remaining and potentially worsening. In situations where surgery is required, the likelihood for success is very good, although very few patients require surgery. Only a small number of patients – around 1-5% – have jaw problems severe enough to need surgery. Some surgical procedures can be painful, often require several weeks for healing, and can be expensive. Some conditions require the jaws to be wired closed to allow healing for up to 6 weeks. As with all surgical procedures, there are many possible risks involved. These include risk from anesthesia, unexpected outcomes, and accidental damage to other anatomical areas. There are usually no alternative options available when an occlusal problem is severe enough to require surgery. Surgery is one of the most expensive options for treating occlusal problems. The condition will continue and worsen without some form of treatment. This form of therapy involves applying a small electrical current to the affected muscles to relax them quickly and easily to reduce pain. TENS offers excellent and fast-acting muscle relaxation therapy and pain relief. A large time commitment is needed, and requires cooperation from and understanding of the patient for treatment to be effective. Further, ongoing treatment may also be necessary. There are no risks involved when TENS is properly applied. However, certain patients such as those that are pregnant or have pacemakers are not suitable for receiving this type of therapy. Other acceptable alternatives to TENS include physical therapy, muscle relaxation medication, occlusal (bite) splints, and pain-relief medication. TENS is a relatively low-cost treatment. Doing nothing will result in the condition continuing and becoming worse. Problems with occlusion (bite) can be highly complex, sometimes confusing, and in many cases, very difficult to treat. Because opinions can vary widely among practitioners, it is recommended to obtain a second, or even third opinion before undergoing treatment. Occlusal issues require highly competent and experienced practitioners who will cooperate with others on the health team, and full patient cooperation and acceptance is required.